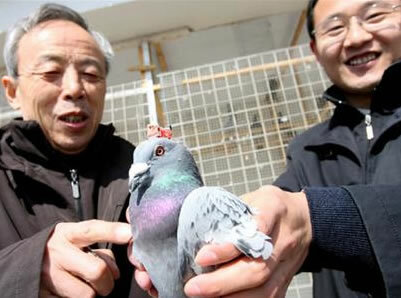 A remote-controlled pigeon has been created at the Robot Research Center at the Shandong University of Science and Technology in Qingdao, China. 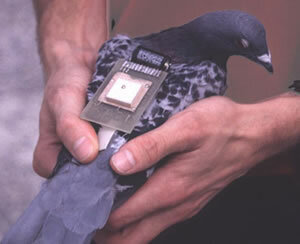 The pigeon is given instructions through a microelectrode and controller board implanted (mostly) in the top of its head. According to researchers, pigeons don't feel pain in their heads, so no problem there. I'm really excited about this, because now DSL can become a working reality. That's Digital Squab Line, of course. 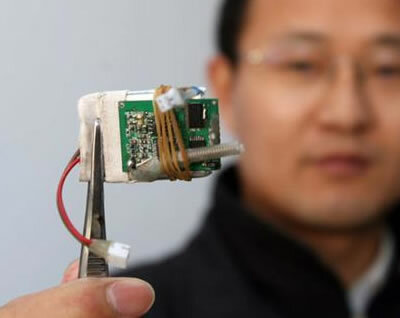 In an experiment carried out three years ago, Israeli hobbyists used homing pigeons to carry four GB of data each in memory chips strapped to their backs. Now that full control over the birds has been achieved, DSL can become a reliable data transfer method. See Digital Squab Line (DSL) Has High Bandwidth for lots more information about how pigeons can carry data.